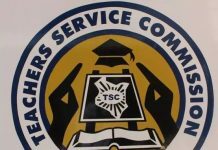 The Teachers Service Commission is advertising 5,000 posts in secondary schools. Applicants for Posts in Secondary institutions must be holders of a minimum of Diploma in Education Certificate. Interested candidates should apply to the Secretary, Board of Management (Principal) of the School/Institution where the vacancy has been advertised and submit a copy to the TSC County Director. Directors and Boards of Management as above not later than 12th February, 2019. The Teacher Service Commission is an equal employer and people with disabilities PWDs are encouraged to apply. The commission will only deal with TSC county director and Board of Management in this exercise. Direct application to the commission will not be considered. Successful applicants must not fill employment forms in more than one school as this will lead to disqualification. The recruitment exercise is free of charge. The Teacher Service Commission wishes to caution applicants against fraudsters who are out to extort money from unsuspecting individuals purporting to be in a position to influence the employment process. Any fraudulent activity should be reported to the nearest police station or to Teachers Service Commission headquarters through the following hotlines between 8.00 am to 5.00 pm. The TSC office at the county or sub county of their choice.